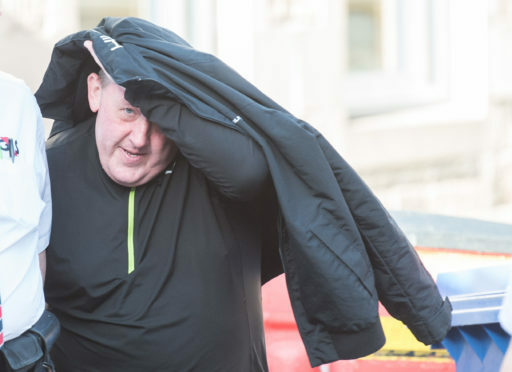 David Smith leaving Elgin Sheriff Court. A man who threatened to shoot staff at a Moray music event – before returning armed with a machete – has been jailed. David Smith made the alarming threat during a performance at the Lossiemouth Folk Festival last year. The 49-year-old was thrown out of the performance at the Beach Bar in the town on July 14 after disturbing concert-goers with “inappropriate and loud” behaviour. However, as he was being escorted from the premises, Smith, who tours the country in his campervan home, shouted threats at staff. Yesterday, the man, who uses his mother’s address at Hillington in Glasgow, was jailed after he appeared at Elgin Sheriff Court. Smith then returned to the bar after going to the festival’s camping area, where his campervan was parked. Mr Corrins added: “He’s again spoken to by staff and advised to leave. Again he’s not happy about it and begins to walk towards the door. Witnesses in the bar described the weapon as a “military machete” that is used in jungles or forests with a blade of about 12 inches. Staff escorted Smith from the premises before contacting police, who later found him at his campervan and seized the weapon. Defence agent Allan Nicol explained his client wished to apologise to everyone affected by the incident. He said: “He’s gone to the folk festival to listen to music and has obviously had too much to drink while he has been there. Smith, of no fixed abode, was sentenced to 243 days in prison after pleading guilty to behaving in a threatening or abusive manner and possessing a sharply pointed blade.